November 7, 2015, Clearwater, FL – Defending champions seldom relinquish titles easily. With Johnny Gonzalez on the mound, they often don’t have a choice. A day after allowing just a pair of runs in a semifinal victory, Gonzalez was in a familiar position – pitching the Raleigh Red Sox to a Fall Classic championship. Gonzalez, a 6-foot-5, 170-pound (on a good day to his own admission) right-hander, joined battery mate Paul Regan to complete a dominating and nearly unthinkable two-day effort. 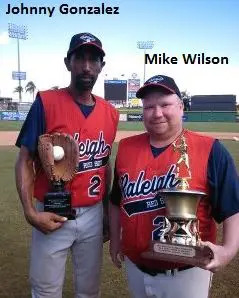 After Raleigh finished round-robin play with a record of 2-3 following a pair of one-run losses – including a 3-2 setback against Atlanta – Regan, with Gonzalez catching, pitched 8.2 hitless innings in a 7-0 playoff victory over Venezuela, before settling for a one-hitter. Later that day, Gonzalez, with Regan catching, was brilliant in a complete game, 10-2 semifinal victory over Puerto Rico. While leadoff man Robert Rudder led all players with three hits, it was the bottom of the order that got Raleigh the only run it would need. With two outs and the bases empty in the second, Chris Budnick laced a double down the third base line. One batter later, Adrian Matlock singled to center, giving the Red Sox a lead it wouldn’t relinquish. The lead stretched to 2-0 in the third, when Rudder singled to right, stole second, advanced to third on a Korre Humes single and scored on a fielder’s choice. With a 2-0 lead seemingly safe, Raleigh put the game away late. Budnick drove in Jeromy Bullman with a bloop single to right, before pinch runner Damian McFadden scored on the Red Sox’s fourth hit of the inning, a single to left by James Harris. When Raleigh tacked on single runs in the eighth and ninth, the final coming when Humes’ booming double to right center plated Rudder, all that was left was for Gonzalez to escape his only jam of the game. Atlanta threatened with runners on second and third and one out, before the righty induced a shallow fly out and ground out to end the threat and claim the championship. WP: Gonzalez (3-1); LP: Gil. Pitching: Gonzalez and Regan (R). Gil, Anderson (7), Mendez (7), Steinmetz (9) and George (A). 2B: Budnick, Humes (R) Steinmetz (A).